Alan Moir is a brilliant cartoonist with the Sydney Morning Herald. 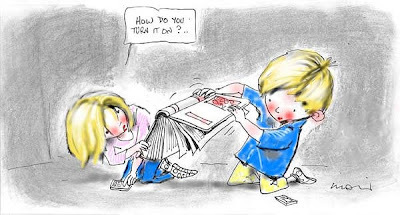 Orginally from New Zealand, (I knew his photographer broither Rex in my Napier bookselling days), Alan has lived in Australia for many years and has established himself as one of the great Aussie cartoonists. Reading this morning's edition (April 2-4, 2010) of the SMH I came across this marvellous cartoon which will resonate with many parents and librarians, booksellers and publishers, indeed all concerned about the future of the book in this electronic age. Thanks Alan Moir for this absolute gem. You are a genius.